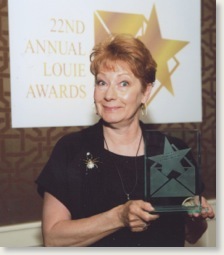 Maggie Mae Sharp, President & CEO of Maggie’s Quill, Inc., was honored with the company’s first LOUIE Award May 17, 2010, in New York City at the 22nd Annual International Greeting Card Awards Gala Event. The worldwide competition (which has been likened to the Academy Awards for greeting cards) recognizes creative excellence in the greeting card industry. A longtime writer and published author, Sharp, along with her husband and Vice President, Roger Stone, incorporated the Black Forest-based Maggie’s Quill, Inc. in 2001 with the release of the Dear Sweet Memories line of greeting cards. Maggie’s Quill, Inc. currently offers 35 card lines that are printed exclusively in the US and (most) always on recycled papers. The company sells cards all over the US and Canada, in both the wholesale and retail marketplaces. 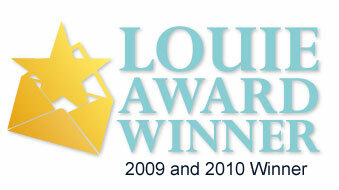 The 2010 LOUIE Awards competition drew nearly 1,896 entries from publishing companies around the world, and Hey, How ‘Bout That! We did it again!!! We won our second LOUIE Award for the 2010 season, with DSM1530 “Old and Senile” Birthday card; placing #1 in the Humorous Birthday, $3.50 and Under. Roger reckons we’re gonna have to build another room onto the office to hold all these trophies. In the Fall of 1996, Maggie Mae Sharp was presented with the Will Rogers Award for Outstanding Achievement in the Advancement of Contemporary Cowboy Skills – as National Lady Cowboy Poet of 1996 – from the Academy of Western Artists. She has also been nominated every year since then, but a different woman will win each year.